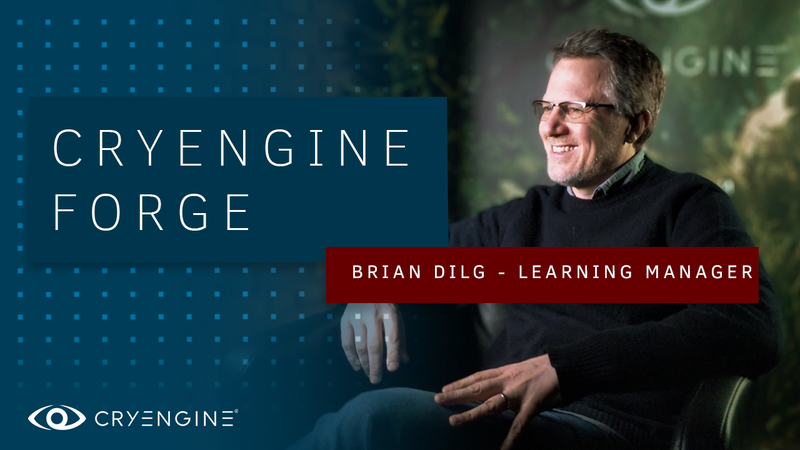 Hi, my name is Brian Dilg, and I'm the CRYENGINE Learning Manager here at Crytek since October 1, 2017. My mandate can be summarized pretty simply: I’m here to make it as easy to learn CRYENGINE as it is rewarding to use. We’ll be rolling out a whole suite of major learning initiatives in the coming months that you’ll see announced on all of our media channels, including online tutorials, classes, courseware, tips, documentation updates, webinars, articles, master classes, and other programs to be announced. Having come to Crytek with no experience using CRYENGINE, I know what it feels like to be new to and overwhelmed by its feature set, whether you’re an artist, a level designer, animator, or programmer. We’re going to create a standardized curriculum that teaches you the core concepts of using the tools as you build mini-games, and many shorter tutorials and long-form webinars in which our own experts show you best practices and their favorite tricks for game development using CRYENGINE. We’ll also be producing many tutorials on extending, customizing, and maximizing the power of the engine through C++. To help us help you, please post all requests for learning materials here in this thread and your contributions in our Community Tutorials forum, as well as feedback on any learning assets as we post them. We know that you all have long wish lists for learning and support materials that we will be working to fulfill. Keeping your requests organized in this one forum will be a huge help; there are simply too many social media platforms and channels for us to be able to comb through thousands of posts looking for requests, although we make an effort to always keep an open channel on the CRYENGINE DEVELOPMENT Discord server where we are present for a more immediate approach. Keep in mind that while we cannot respond to every individual request with a new tutorial, we will watch your requests to help us prioritize our learning asset production, and by making it much, much easier to learn and use CRYENGINE, we will also make it easier for you as community members to help each other. To that end, one of the first major posts you're going to see from me is a tutorial about how to make great tutorials, including tips specific to video production and written formats. If you happen to be in Germany or around, you can be amongst the first to sign up for our first live CRYENGINE crash course at events being held at SAE Institute (Leipzig Dec. 9 and Hanover Dec. 16, 2017) and Games Academy (Frankfurt January 17 and Berlin January 31, 2018 - watch their web site for the official announcement). Note that these seminars will be conducted in English. I’m looking forward to helping you all become CRYENGINE masters! Glad to see this initiative, and welcome to Cryengine Brian. Last edited by ahmad0karami on Mon Dec 04, 2017 9:07 pm, edited 1 time in total. Thanks a lot and good luck!! huge congrats Brian ! I'm very happy to see Crytek moving in the right direction. I think would be awesome to have proper game tutorials, like from start to finish little game projects. I'm talking about game genres unusual to CE in general because there is this idea that CE is just for FPS and I think this is the first prejudice to fight. I'm aware that since Schemantyc will be replaced with the new version it is better to wait for the new one to start teaching it in the best way as possible, so I hope it will be launched as ASAP. How to create a fully functional weapon system in CE 5.4 using templates. The one in 1st and 3rd person templates is lacking in a number of ways. I.e : fire particle and do damage to an entity. A vote could come in handy on the forums then top 3 or 1 get the green light for making. or even a survey thing could help get info quicker and help you guys out on what to make. looking forward to all these new tutorials. Nice! Crytek is heading into the right direction. My wish: How to master Cryengine lighting. Including environment editor, SVOGI, GI without voxels. Hi, hope to see you around the forums. -creating land for set biomes.